View of Llangollen Bridge over the River Dee in Wales. There has been a crossing on this site since the 13th century but it was not until 1345 that stone was used for a permanent structure. 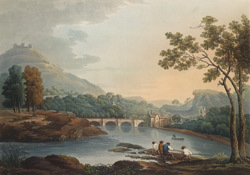 Further modifications were made in the 16th century and this is the bridge which can be seen in the print. It has been attributed to John Trefor, Bishop of Asaph. Castle Dinas Bran can be seen at the peak of the hill over looking the town below. Dinas Bran translates as ‘Hill of the Crow’ or ‘Fort Raven’ and it is thought that the castle was built by Gruffydd Maelor II in the late 1260s.